PHI and Malmö University have a long-standing collaboration, dating back to 2008. The collaboration has resulted in several peer reviewed publications and a doctoral thesis. In late 2016, the European Commission granted 2.1 million euro to GlycoImaging – a joint cancer research project to develop improved methods for clinically diagnosing cancer. Current methods for diagnosing cancer primarily focus on the proteins associated with cancer. However, there is increasing evidence that carbohydrates play an important role in the development and pro­gression of malignant cancer. Current methods use and rely on antibodies created by living organisms. These natural antibodies, however, are not sufficiently specific to accurately detect and image carbohydrates. 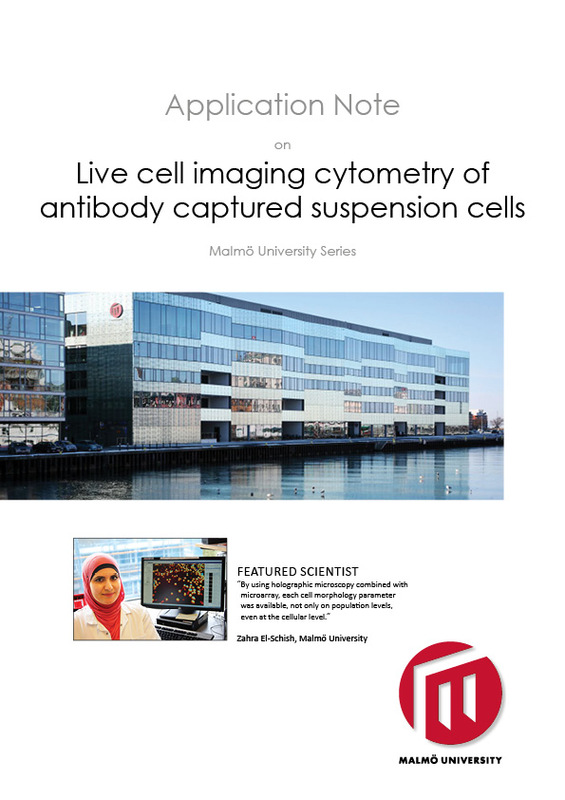 The GlycoImaging project is coordinated by Malmö University and commercialized by PHI. Additional partners are Bundesanstalt für Materialforschung und Prüfung (Germany’s federal technology research institute), Umeå, Copenhagen and Turku University. Popular lecture on cancer research by Prof. Anette Gjörloff Wingren 2016 (in Swedish). The GlycoImaging video (in Swedish). A short presentation of GlycoImaging by Prof. Anette Gjörloff Wingren (in Swedish). “In the near future”, Zahra El-Schich says, “you could have a HoloMonitor in every clinic. You could also customize cancer treatment for every patient by just using a simple tumor test.” Find out how. 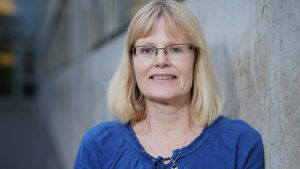 Using nanoparticles and HoloMonitor technology Prof. Anette Gjörloff Wingren and her team aim to develop an early screening method that detects cancer by a simple blood test. Commentary article discussing the fundamental role of cell movement studies in cancer research. Advantages of the HoloMonitor Track Cells and Wound Healing modules over the transwell migration and invasion assays are highlighted, and includes the possibility to use the cells in experiments for other purposes after completing the imaging. In addition to single cell tracking, the HoloMonitor technology also benefits from the fact that morphology analysis can be performed of each cell. The author concludes that this indeed opens up for almost unlimited possibilities to perform cell morphology analysis using this methodology, since each image is very rich in cellular information. Review providing a current insight into QPI (quantitative phase imaging) applied to cancer research. The authors conclude that QPI is an ideal method for studying live cell dynamics by providing data from noninvasive monitoring over arbitrary time scales. The effect of drugs on migration, proliferation, and apoptosis of cancer cells are emerging fields suitable for QPI analysis. The authors also point out that need for QPI applications in clinical cancer diagnostics and treatments is emerging. The morphological changes observed occur before and at lower concentrations than a reduction in cell metabolic activity or viability. 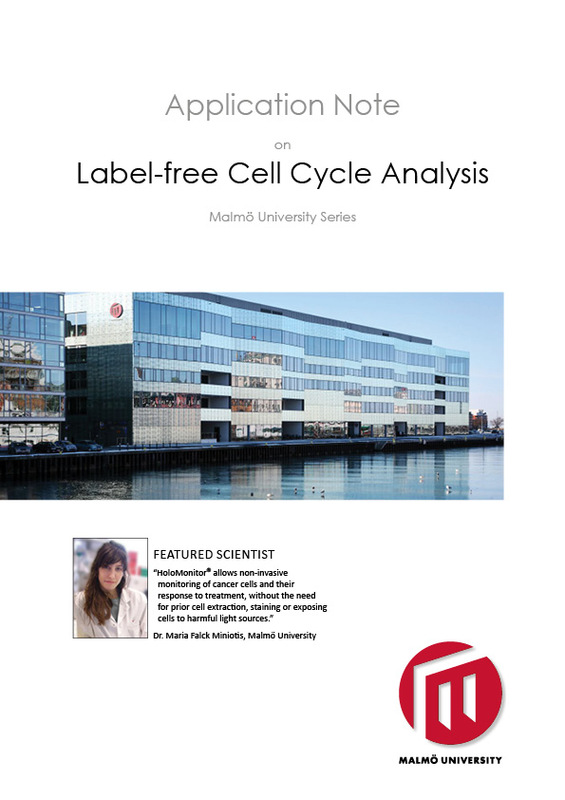 Three classifiers are compared and we report a best case sensitivity of 88% and specificity of 94% for classification of cells as treated/untreated. The article provides proof of concept for using holographic microscopy combined with antibody-based microarray technology for detecting morphological changes in captured cells. We show that average cell phase volume results from DHM readings are comparable to the flow cytometry findings. DHM thus provides a non-disruptive alternative to flow cytometry. The technique has the potential to develop into a fast and cost-efficient method for pre-clinical monitoring of cancer treatment efficacy. To analyze morphological changes of death cells, HoloMonitor was used. Digital holographic microscopy is an approach for label-free non-invasive 3D imaging of cultured cells. We have analyzed cell death of adherent cancer cells using HoloMonitor and developed it to analyze suspension cells by combining this technique with antibody based micro­assays. HoloMonitor can be used for cell-death induced cell analysis of both adherent cells and suspension cells.